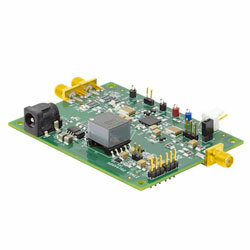 Analog Devices EVAL-HV4702-1CPZ Evaluation Board is configured to evaluate the performance of the ADHV4702-1 amplifier. The board is provided in a 7mm x 7mm, 12-lead LFCSP with an exposed pad at the bottom. The bottom side of the board provides a large exposed copper area for connecting a heat sink giving further thermal management. The device is a six-layer board created to minimise leakage currents utilising the guard ring feature. The device takes Subminiature Version A (SMA), and Subminiature Version B (SMB) edge mounted connectors on the inputs for simple connection to test equipment or other circuitry. An extra safety feature on the board is acrylic plastic guards covered on the top and bottom, decreasing the risk of inadvertent contact with high voltage.